The new book Fritz Kraemer on Excellence. Missionary, Mentor and Pentagon Strategist was presented for the first time to an interested and enthusiastic public in Berlin, Munich, Washington D.C. and New York. In the venerable Parliamentary Society across from the Reichstag (the House of Parliament) in Berlin, General (Ret.) Klaus Naumann, former Chief of Staff of the German Federal Armed Forces and Chairman of the NATO Military Committee, presented his thoughts on patriotism and the Kraemer aphorism of „provocative weakness“ in Europe to more than 100 guests - including ambassadors, members of the German Parliament and the Federal Ministry of Defense. Friedrich Merz, Deputy Chairman of the CDU/CSU opposition party in the German Parliament, one of the most prominent and popular politicians in Germany, added his thoughts on the Kraemer book and on moral values in politics. 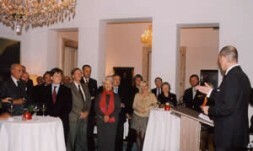 In Munich, more than 200 guests attended the book presentation at the private home of the author and World Security Network founder Hubertus Hoffmann. In attendance was a colorful mix of military officials such as former KFOR Commanding General (Ret.) Klaus Reinhardt; representatives of industry including Dr. Thomas Enders, Member of the Board of EADS; members of the academic community represented by Prof. Werner Weidenfeld CAP Institute and Prof. James W. Davis Jr., of the Geschwister Scholl Institute at Munich University; as well as journalists and prominent actors such as Uschi Glas. Order Fritz Kraemer on Excellence now as a Christmas gift at the preferential price here! You will receive delivery within a few days.